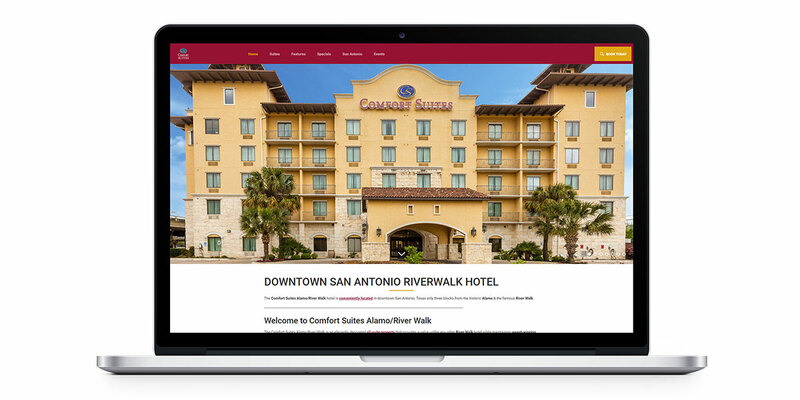 In April 2017, the Comfort Suites Alamo/ River Walk added our new SEO marketing services to its Vizlly subscription. While it’s still early days, the initial results are in – and they’re impressive. In just two months, the hotel’s website has risen in organic search rankings, now visible alongside influential travel websites like TripAdvisor, Hotels.com and Booking.com on Page 1 of search results. This adds to the existing success the Comfort Suites Alamo/River Walk has already seen with Vizlly. Sherry Chaudhry, co-owner of the property, first came to Vizlly looking for a way to reclaim direct bookings and cut her OTA commissions. Vizlly helped her launch a standalone website for her property (separate from Choicehotels.com) that told its unique story and was optimized to convert. In the first month, her website generated 25 new direct bookings, and Sherry had ZERO cancellations from any of them, which she was very happy with. Based on these results, Sherry knew she was onto a good thing. In an effort to drive more traffic to her website, she decided to upgrade her Vizlly subscription to include our new SEO digital marketing services. Travel shoppers searching specifically for “Comfort Suites Alamo” can now easily find Sherry’s website. The image below shows it ranking second in organic search results, behind Choicehotels.com. This is great news for Sherry. Her direct booking channels (brand.com & own standalone website) dominate the top 2 positions of the Search Engine Results Page (SERP), increasing her likelihood of direct booking success. This is important because studies have shown that the first position in organic search results has a 34% clickthrough rate on desktop, and 31% clickthrough rate on mobile. That number declines as you move further down the page. In this case, that’s a good thing, as the OTAs (Hotels.com, Expedia.com and Booking.com) appear further down the page. Sherry’s website also ranks well for a slightly different branded search term (“comfort suite alamo river walk”). In fact, her website outranks even Choicehotels.com for this! For both branded searches, Sherry’s direct booking channels have optimal real estate on the search results page. 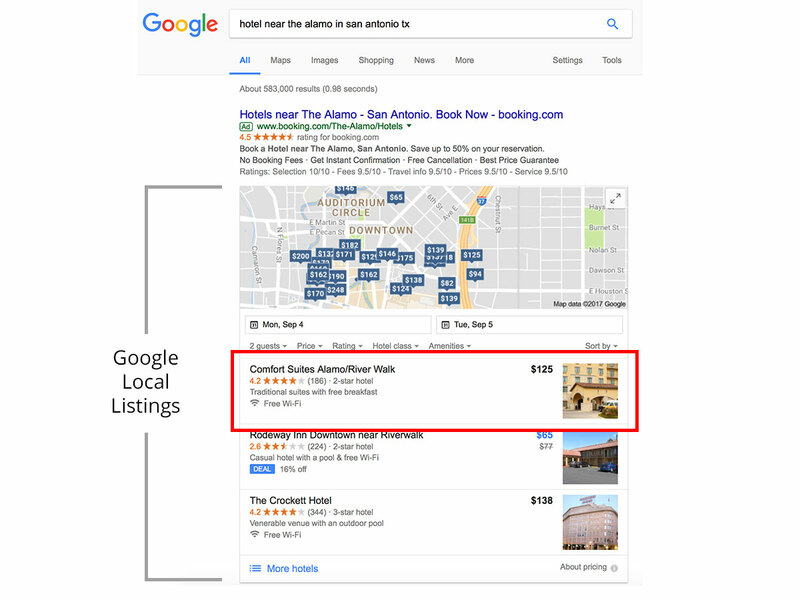 This includes Google’s knowledge graph on the right, which allows travel shoppers to read reviews, view photos of the property, and click through directly to the website. Long-tail keywords are more specific in nature than head terms (e.g. “hotels in Alamo”), so they are less competitive to rank for. 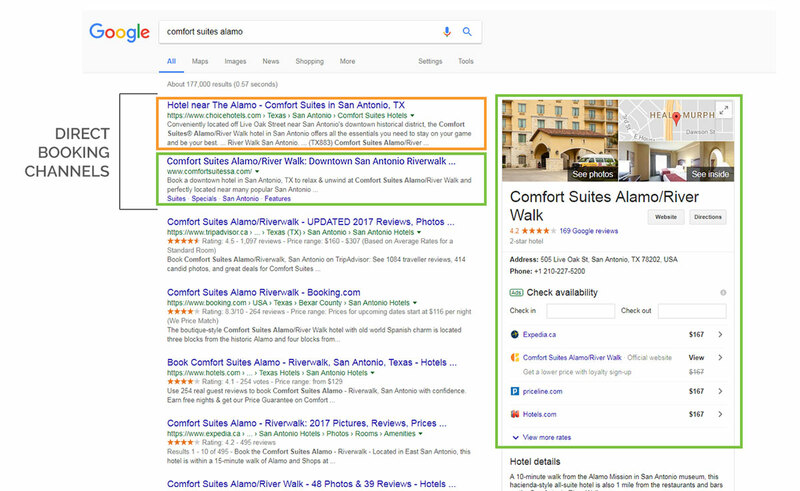 You can see below that the Comfort Suites Alamo/River Walk ranks FIRST in Google’s local listing for this long-tail search term! This is important because organic listings have been found to garner more clicks than paid ads. The Comfort Suites is the first organic listing visible on the page, which is the ideal position to be in. Another benefit of ranking for long-tail keywords is that it helps drive more qualified traffic to your website. In other words, people who are closer to making a booking. A long-tail search indicates someone has already done their research and defined their hotel shopping criteria. In this case, someone is searching for a hotel in Alamo near the River Walk. This location is important to them and will define which hotel they ultimately book with. These qualified travel shoppers are ideal to drive to your website. Their credit card is out and they’re ready to use it! 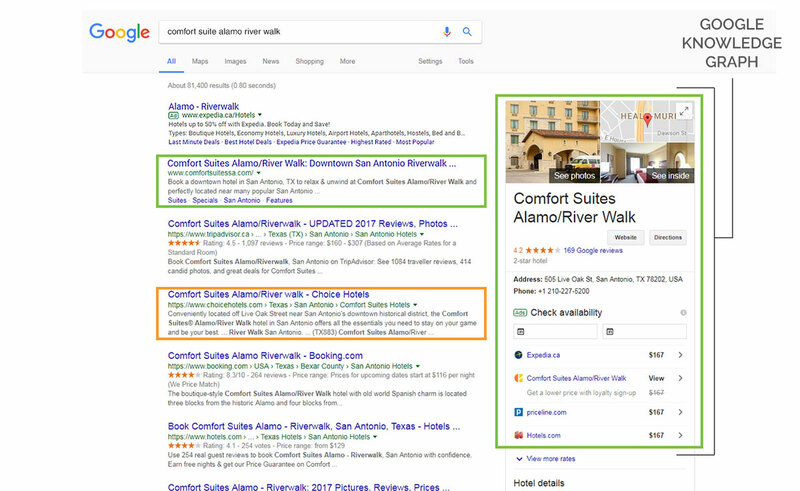 It’s great to see the Comfort Suites Alamo/River Walk well-positioned in organic search results to capture them. It’s important to remember that these are early results for the Comfort Suites Alamo/River Walk. SEO is a long-term game. It can take months, if not years, to climb in organic search rankings. We expect to see even more positive results as the Comfort Suites Alamo/ River Walk continues to gain its SEO strength. Stay tuned! To learn more about the Comfort Suites Alamo/River Walk’s success with Vizlly, check out their case study. 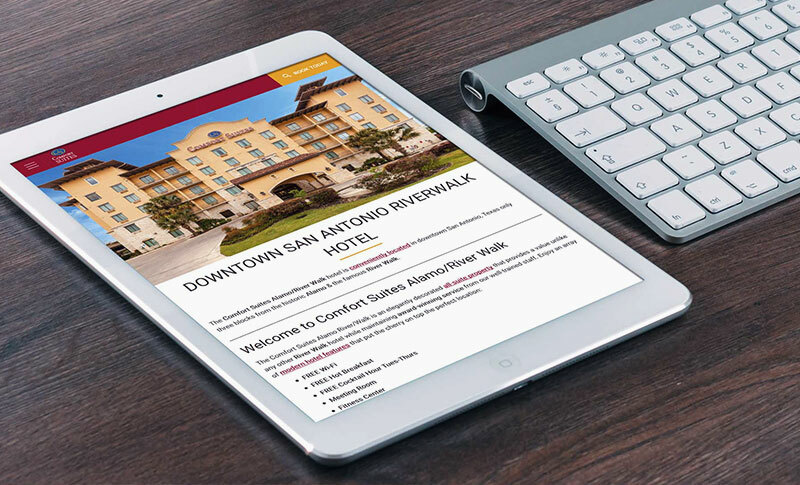 How the Comfort Suites Alamo/River Walk drove 25 new direct bookings in 1 month.